The artist to (Durand-Ruel, New York and Paris); sold 22 November 1927 to Chester Dale [1882-1962], New York; bequest 1963 to NGA. Date and source of acquisition according to Chester Dale papers in NGA curatorial files. Dale, Maud. Before Manet to Modigliani from the Chester Dale Collection. New York, 1929: no. 46, repro. Dale, Maud. "French Art in the Chester Dale Collection." Art News (27 April 1929): 46, repro. French Paintings from the Chester Dale Collection. National Gallery of Art, Washington, 1942: 51, repro., as Madame Monet under the Willows. French Paintings from the Chester Dale Collection. National Gallery of Art, Washington, 1944: 51, repro., as Madame Monet Under the Willows. French Paintings from the Chester Dale Collection. National Gallery of Art, Washington, 1953: 59, repro., as Madame Monet under the Willows. Shapley, Fern Rusk. Comparisons in Art: A Companion to the National Gallery of Art, Washington, DC. London, 1957 (reprinted 1959): pl. 53, as Madame Monet under the Willows. Walker, John. National Gallery of Art, Washington, D.C. New York, 1963 (reprinted 1964 in French, German, and Spanish): 326, repro., as Madame Monet under the Willows. Eighteenth and Nineteenth Century Paintings & Sculpture of the French School in the Chester Dale Collection, National Gallery of Art, Washington, 1965: 92, repro., as Madame Monet under the Willows. Summary Catalogue of European Paintings and Sculpture. 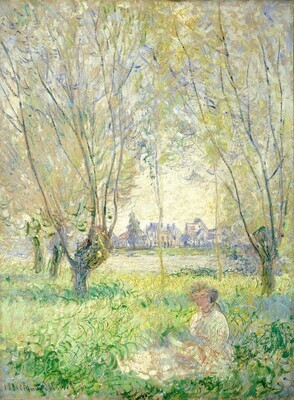 National Gallery of Art, Washington, 1965: 92, as Madame Monet under the Willows. European Paintings and Sculpture, Illustrations. National Gallery of Art, Washington, 1968: 82, repro. Rossi Bortolatto, Luigina. Tout l'oeuvre peint de Monet. Paris, c. 1972:no. 190. Wildenstein, Daniel. Claude Monet: biographie et catalogue raisonné. 5 vols. Lausanne and Paris, 1974-1991: 1:no. 613. European Paintings: An Illustrated Summary Catalogue. National Gallery of Art, Washington, 1975: 240, repro. Walker, John. National Gallery of Art, Washington. Rev. ed. New York, 1984: 491, no. 729, color repro. European Paintings: An Illustrated Catalogue. National Gallery of Art, Washington, 1985: 278, repro. Monet: The Seine and the Sea. Exh. cat., National Galleries of Scotland, Edinburgh, 2003:94, repro.